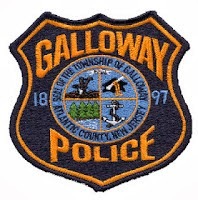 Galloway Township Police responded to 781 calls for service during August 28, 2016 through September 3, 2016. Additional statistics include: 4 Burglaries, 0 Car Burglaries, 25 Motor Vehicle Accidents, 184 Tickets issued, 2 Driving While Intoxicated, 42 Arrests, 14 Domestic Violence, 5 Fire Calls, 17 EMS Calls and 1 Juvenile calls. 300 Block of E. White Horse Pike.